Because the Knights have a special calling to support the Church in its endeavors, we should do our best to assist every parish in celebrating Divine Mercy Sunday. It is very clear, that this feast is to be a refuge and shelter for all souls, but especially those who have fallen away. This Feast of Mercy offers souls a complete pardon of all sins and punishment. As Knights we are called to do acts of charity and there could be no greater act of charity than to participate in the salvation of lost souls. This program is especially designed for Knights of Columbus councils and assemblies so that they may help our parishes to celebrate this great feast called Divine Mercy Sunday. One of the requirements of the proper celebration of this new feast is the veneration of the Image of the Divine Mercy and this is a very special opportunity to help our Church to save countless lost souls with this “Knights of Mercy Program”. How can we help to save lost souls? Jesus made a promise for the total pardon of all sins and punishment for souls that would go to Confession and receive Communion on this Feast of Mercy. The Church has established this feast as (Divine Mercy Sunday) in the year 2000, but there is an urgent need for parishes to correctly celebrate it as a true refuge for poor sinners. Our Lord did not come for the righteous, but for sinners. To ensure that the Church correctly celebrates this feast, the Vatican issued a special Plenary Indulgence decree specifically for Divine Mercy Sunday. This decree includes instructions for priests to inform the faithful about the special plenary indulgence, to be generous and prompt to hear Confessions and to lead the prayers for the indulgences. There are many parishes that have not yet followed these instructions, nor understood the benefits of celebrating this feast, and this is where the Knights can really help out. It is clear that the Church has established this feast as a means to rebuild the Church and to prepare for the Second Coming of Christ. Blessed Pope John Paul II died on the feast in 2005 and left a written request asking for a greater understanding of Divine Mercy. We can best help our own parishes by equipping them with all the necessary information and an image of the Divine Mercy, which is central to a proper celebration. We have many Catholics that have fallen away from the Church and from the practice of their faith. There are many souls who have not confessed their sins in a long time and these poor souls could also perish for all eternity. What better acts of charity could we do, as Knights, than to assist all of our parishes in celebrating this great feast which can provide for all souls the gift of the total forgiveness of all sins and punishment? Blessed Pope John Paul II stated in his greetings to the KofC in 2002 “The theme for the 120th Supreme Convention (“Now Is the Time for the Great Catch”) is a summons to ever trust in the Lord’s command to 'put out into the deep' ( Lk 5:4) in obedience to His word." Our Lord called out to His Vicar, Pope John Paul II, as He did to Peter “to cast our nets out once again” using Divine Mercy Sunday to obtain that Great Catch. We must help our Church to let down these great nets of mercy. The results, as we remember from Luke’s Gospel, was an incredible catch of fish. In the same way, by trusting in the promise of Our Lord, for a complete pardon, we can bring home many forgotten lost souls on this great new Feast of Divine Mercy (Divine Mercy Sunday). It is crystal clear that we must, as Knights of Columbus, do everything that we possibly can to spread this message of Divine Mercy. What follows is a simple plan to ensure that every parish will be perfectly prepared to properly celebrate Divine Mercy Sunday. This will bring about a great evangelization in the Church and bring home many souls. 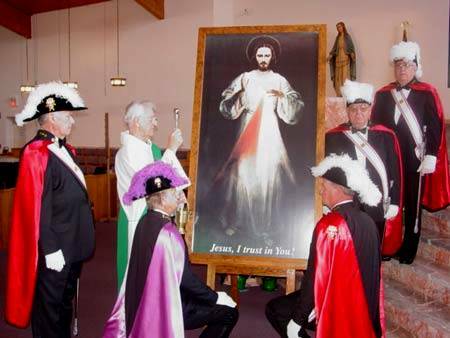 This “Apostles” image is very similar to the Knights of Columbus image that traveled to many parishes during the year of prayer in honor of Pope John Paul. This 6 ft. image pictured was a gift to Saint Lucie Parish in Port Saint Lucie by Council # 7514. It has proven to be a great consolation for many. 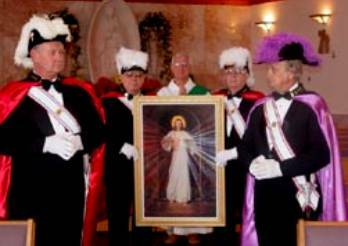 On Divine Mercy Sunday this image was processed by the Color Guards and then enthroned. Get one placed in your parish! 1. 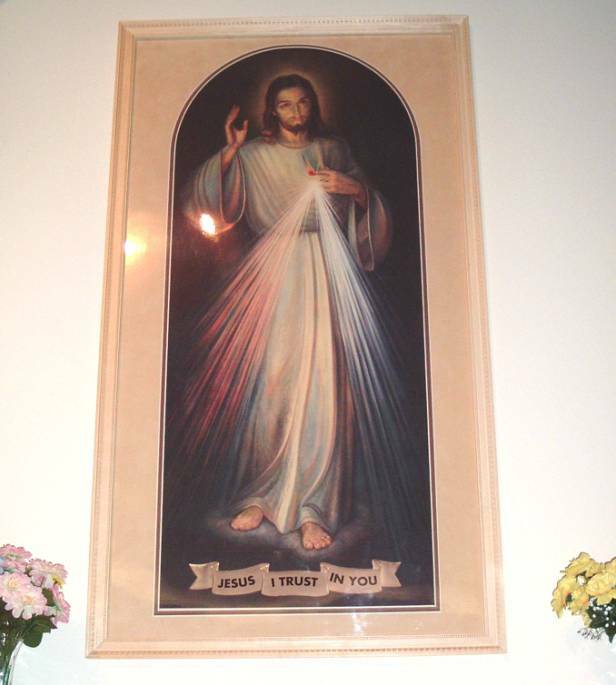 Check with your parish: See if your parish has an Image of the Divine Mercy. Every parish should have one of these images as recommended by the Holy Father. If they need an image, the Knights could offer to purchase one for the parish. The goal is to have an image venerated in every single parish. If your parish already has a good size image, then proceed to step 4 in the program. 2. Show your pastor the images: Before purchasing an image, check with your pastor to see which one he likes the best. Show him the different kinds that are available by printing out the Online Catalog at www.DivineMercySunday.com and let him pick it out the one he likes. Some of the pastors will permanently install these images in their churches with a candle shrine. We have found that if the pastor selects the image then he will most likely take ownership of it, and that will result in a grand celebration of Divine Mercy Sunday in your parish. 3. Show your pastor the need for the images: Sometimes a pastor might feel intimidated by someone offering to buy an image for the church. You can help him to be at ease about it very easily. Print out the image article and show your pastor what our Pope Benedict XVI has said about placing images of Jesus, the Divine Mercy in churches, found on the www.DivineMercySunday.com website. 4. Offer to have a procession: Make your pastor an offer to process with the Image of Divine Mercy using the Color Guards (if possible) on Divine Mercy Sunday. Remember that Our Lord asked that the image be solemnly blessed and venerated on this Feast of Mercy. There could be no greater recognition and veneration given to this special image than by a grand KofC procession! 5. Approach your pastor once again: Ask him if he has a copy of the Decree for the Plenary Indulgence for Divine Mercy Sunday. If he does not have a copy, you can print out a copy by clicking on the words above in red or by getting it on the www.DivineMercySunday.com website. He will appreciate the information that comes directly from the Vatican. Be sure to approach him with respect. 6. Provide information about the feast: Also on this website are many different articles about Divine Mercy Sunday that could be used for local and diocesan newspapers and there is also a very good Easter bulletin insert. Try to focus on reaching those souls that have been away from the Church and those that have not been to Confession in a long time and are in need of receiving mercy. 7. Encourage your pastor: Try to encourage your pastor to announce the feast on Easter when there are usually many people in attendance that do not attend mass on a regular basis. These are some of the poor souls that could benefit most by the Plenary Indulgence that is available on Divine Mercy Sunday. Print out for all priests the “How to Celebrate Mercy Sunday” leaflet on the website. 8. Prepare your fellow members: Explain to your fellow KofC members about all the graces that are available on Divine Mercy Sunday. 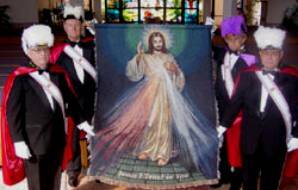 Provide information so that they may tell others about Divine Mercy Sunday. Many souls have fallen away from going to Confession on a regular basis. Our Holy Father has called us all to resume the practice of more frequent regular (monthly) Confessions. 9. Ask for extra Confession time: Ask your pastor if he could make extra time to hear the Confessions of those that have not confessed for Easter. According to a Vatican document, released in 2000, called "The Gift of the Indulgence" it is allowed for someone to go to Confession within about 20 days before or after the feast to receive the promise of the forgiveness of sins and punishment. 12. Don’t forget that Divine Mercy Sunday is not “a private party for devotees” but instead it is what Jesus refers to as a “Refuge and shelter for all souls, and especially poor sinners”. (Diary, entry 699) Make sure that your parish is doing everything that it possibly can to get souls to come back to the practice of their faith. This is the reason for this great Feast of Mercy, Divine Mercy Sunday! 13. Trust in Jesus: Do all you can, check out www.DivineMercySunday.com . If you need any help just call us at 1-888-732-0722 and we will walk you through it. You will be making all of Heaven rejoice over many lost souls coming home! For more detailed information about helping your parish to grow by celebrating Divine Mercy Sunday go to the www.DivineMercySunday.com website or call Robert R. Allard at 1-888-732-0722. Taken from the www.divinemercysunday.com website's "Knights of Mercy Program". This program was originally designed with the help of the Knights of Columbus Supreme Council. The cover photo was from an article about the Knights of Mercy Program covered in Columbia Magazine.